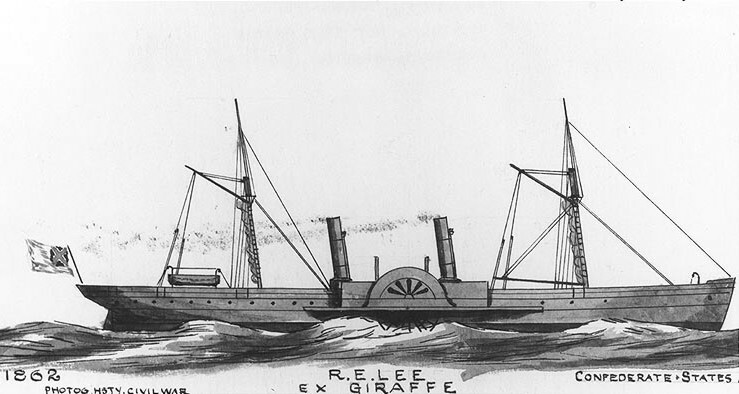 After the Civil War (1876 to be exact), John Wilkinson wrote and published his memoirs of his blockade running days as captain aboard the Giraffe – later, renamed the Robert E. Lee. This excerpt describes the Giraffes arrival in Wilmington, North Carolina with a tense situation adding to the blockade running challenge. Everything being in readiness, we sailed on December 26th, 1862. Having on board a Charleston pilot, as well as one for Wilmington, I had not determined, on sailing, which port to attempt; but having made the land near Charleston bar during thick weather on the night of the 28th, our pilot was afraid to venture further. We made and offing, therefore before daylight; and circumstances favouring Wilmington, we approached the western bar on the night of December 29th. We had been biding our time since twelve o’clock that day close in to the shore about forty miles southwest of the bar and in the deep bay formed by the coast between Wilmington and Charleston. 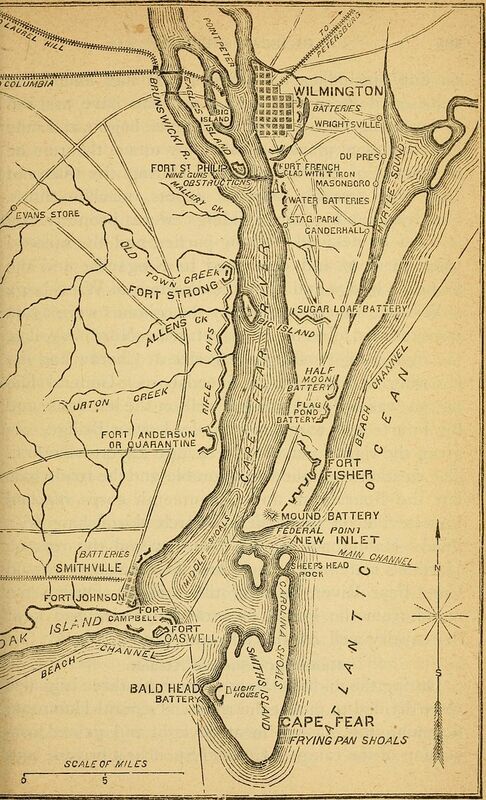 The weather had been so clear and the sea so smooth that we had communicated with the Confederate pickets at several points along the coast; and no sail was visible even from aloft until about three o’clock in the afternoon, when a cruiser hove in sight to the north and east. As she was coasting along the land and approaching us we turned the Giraffe’s bow away from her, and got up more steam, easily preserving our distance, as the stranger was steaming at a low rate of speed. A little while before sunset the strange steamer wore round, and we immediately followed her example, gradually lessening the distance between us, and an hour or more after dark we had the please of passing inside of her at anchor of New River Inlet. She was evidently blockading that harbor and had run own the coast to reconnoitre. Before approaching the bar I had adopted certain precautions against disaster which I ever afterwards followed. Any one who showed an open light when we were near the fleet was liable to the penalty of death upon the spot; a cool, steady leadsman was stationed on each quarter to give the soundings; a staunch old quartermaster took the wheel and a kedge, bent to a stout hawser, was slung at each quarter. All lights were extinguished; the fire-room hatch covered over with a tarpaulin; and a hood fitted over the binnacle, with a small circular opening for the helmsman to see the compass through the aperture. About ten o’clock we passed inside the first ship of the blockading fleet, about five miles outside the bar; and four or five others appeared in quick succession as the Giraffe was cutting rapidly through the smooth water. We were going at full speed when, with a shock that threw nearly every one on board off his feet, the steamer was brought up “all standing” and hard and fast aground! The nearest blockader was fearfully close to us, and all seemed lost. We had struck upon “the Lump,” a small sandy knoll two or three miles outside the bar with deep water on both sides of it. That knoll was the “rock ahead” during the whole war, of the blockade-runners, for it was impossible in the obscurity of night to judge accurately of the distance to the coast, and there were no landmarks or bearings which would enable them to steer clear of it. Many a ton of valuable freight has been launched overboard there; and, indeed, all the approaches to Wilmington are paved as thickly with valuables as a certain place is said to be with good intentions. The first order was to lower the two quarter boat: in one of them were packed the Scotch lithographers who were safely landed; and a kedge was lowered into the other with orders to the officer in charge to pull of shore and drop the kedge. The risk, though imminent, was much reduced after our panic stricken passengers had got fairly away from the emergency. The glimmer of a light, or an incautiously loud order would bring a broadside from that frowning batter crashing through our bulwarks. So near the goal (I thought) and now to fail! But I did not despair. To execute the order to drop the kedge, it was necessary to directly approach one of the blockaders, and so near to her did they let it go, that the officer of the boat was afraid to call out that it had been drooped; and muffled oars as he returned to make his report. Fortunately, the tide was rising. A map of Wilmington, North Carolina. At which last remark, D., losing all patience, exclaimed, “G-d, A——y, man, there isn’t any rock as big as my hat in the whole d—-d state of North Carolina.” A too sweeping assertion, but quite true as applied to the coast. We passed safely over the bar; and steaming up the river, anchored of Smithville a little before midnight of the 29th of December, 1862. Excerpt from Confederate Blockade Runner: The Personal Recollections of an Officer of the Confederate Navy, by John Wilkinson; first published in 1876. And with that exciting narrative, it’s time to wrap-up our mini-series on blockade runners in the year long series “19th Century Maritime.” Come join us for the conclusion post next Wednesday and take a guess at our mid-week series topic for 2018!